A couple weeks back I shared a new bag that I had started and today I'm sharing that finished duffle with you (yay for a finish!). This bag has already been tried and even tested. Over the past 7 days I have been on 5 airplanes and a helicopter, and while all the traveling is exhausting, seeing this lovely handmade goodness at my side never ceases to make me smile. 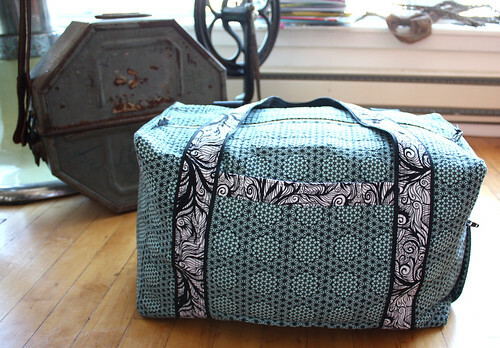 I followed the carry-on size duffle bag pattern by StudioCherie however I did make a few minor adjustments. Inspired by Heather's bag, I added a zipper lining to give the inside appearance of the bag a more polished look as well as altered the zipper tabs to be shorter and square (rather than rounded). I also decided to add a pocket on the one empty side of the bag (the front). I used 80/20 cotton/poly batting for the bag body, and duck cloth in all four side pockets. In these photos my bag is already packed, but trust me when I say that this bag holds its shape pretty well even if it's not full. This bag holds a heck of a lot of stuff, and when it's jammed full like this one, it is heavy! I'm glad I decided to keep the trolley sleeve on the back of the bag, it definitely helps at the airport. Making this bag was only the second time I had ever used a serger but gosh am I ever hooked! I don't think I would have liked the bag making process quite as much had I needed to zigzag all of my edges (but maybe that's just my sour disposition to the tedious/slower zigzag process). 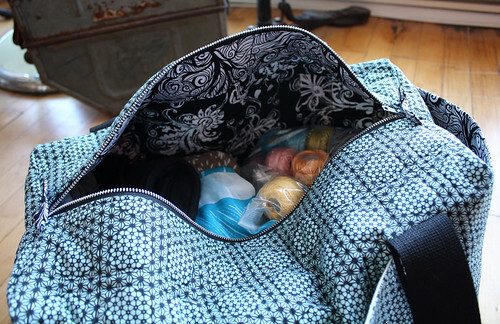 Use Clover Wonder Clips to hold the pieces together when you start assembling the bag. 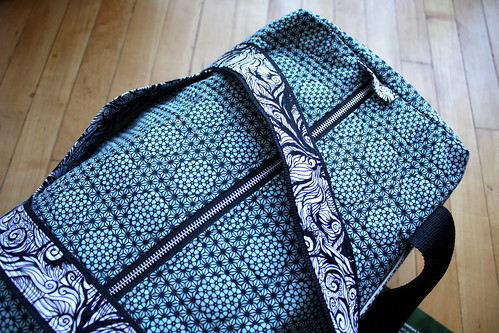 Use a denim needle when piecing the bag as well as for sewing the nylon strapping. Cherie suggests diamond quilting but I choose more of a plaid. More stitches give more structure (but also take more time so account for that). When I originally went to purchase 2" nylon strapping from my local Fabricland, they only had white in stock (which had me seriously questioning what I wanted to try next). In the end I totally lucked out, finding the black strapping at a Fabricland across town. While many lovely bloggers left suggestions for alternative options, I was really happy to know my original envisioned strap would come true. Since I have 10 feet of 2" white strapping now, I may just have to make myself another duffle soon!This project marks my first completed project in my goal to finish 15 in 15 weeks, and it has got me all fired up to keep on finishing! This project was my July goal for A Lovely Year of Finishes. I am also linking up to Needle and Thread Thursday over at My Quilt Infatuation and at Finish it up Friday over at Crazy Mom Quilts. It looks amazing! Great job knockin' one off the list! And glad the straps worked out the way you wanted, it's always nice when that happens eh?! great bag! I love your fabrics, and I think the side pocket was a smart addition. If you get a chance, you should hop over and share it at Needle and Thread Thursday. It will be open through today! I'm so glad you decided to share at Needle and Thread Thursday! That is sew neat!! I love the shape, the nicely sewn finish, the pocket, which is essential! And the peak inside. I am inspiried. just went to the etsy shop and ordered my own pattern! yay! This is so inspiring, will have to pin this so I can find it for reference. 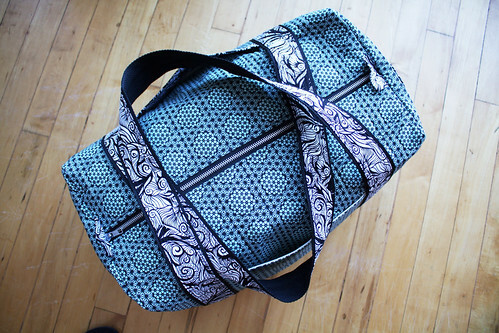 It really is a great shape and with your fabric choices, one of the nicest hand made bags I've seen! Good luck with 15 in 15! That's moving! Another bag.. ohhh darn. This one is great. And you got to try it out right away - whoop! What a great finish! It's so fun using bags you made on trips. What in the world is a trolley sleeve? If I had seen this bag with you on one of those five planes, I'd have wondered where you bought it. And I am a sewer! Bad me. I WILL be brave and tackle a bag soon! Thank you for more encouragement and inspiration. Your bag is a winner. As one who flies cross-country I know that having that bag would cheer me up too! Congrats on a great finish! I just looked at your framed nursery art tute. Hurray for me to find your cute project! It's so darn cute and great for remedial crafters like me! I can't make a quilt for every baby, this will help me so much. Thanks! This is so beautiful! 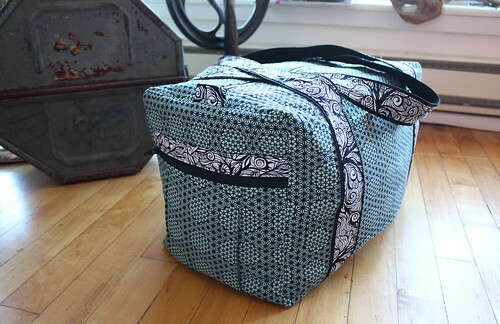 I have been wanting to make a duffel for a long time now, but it seems to intimidating. Thanks for sharing! I want to make one! Great job! From A & K - We Have a Winner! !